They are addicts and napkin abusers, twiddling with pens and taking advantage of any clean surface in sight. Having worried about doodle junkies for a long time, SUPERSWEET was happy to discover a digital rehab, where support is available anytime. All you need to do is admit your problem and be wired. 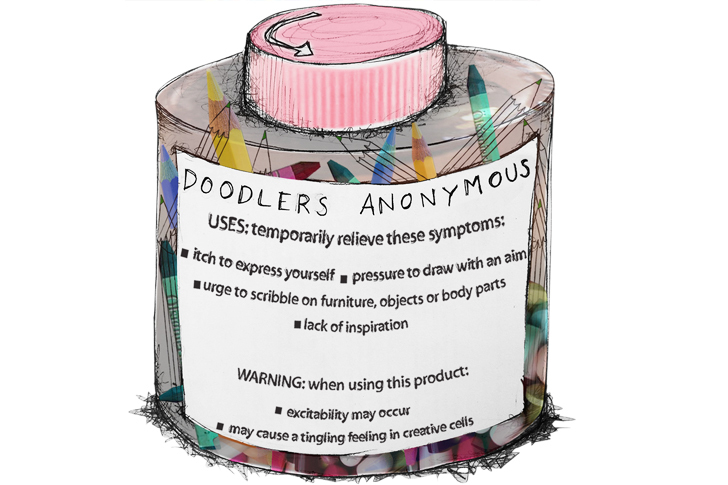 Doodlers Anonymous is an online meeting point for the ones living in symbiosis with pencils and paper. It’s an initiative of Okat a doodler addict who decided to take action and bring all the drawing junkies together to celebrate their addiction. “Hello, my name is ____ and I’m a doodler addict” has been said already 2012 times, and the number of scribblers admitting their unmanageable obsession and becoming members of DA is growing day by day. Some of them are open about their addiction, others prefer joining in facelessly, and the onlookers still in denial just come to get their doze of inspiration. Doodlers Anonymous is not a place for restoring your sanity: channeling your pen’s uncontrollable flow is the key. Giving a digital platform for conquering creative frustrations, DA offers eye candy to first-aid the most urgent need for doodling and enlightening interviews with others obsessed. It’s a digital peer group experience, a remedy for the symptoms of seriously and less seriously addicted doodlers. On DA website, creativity gets contagious and you’ll be dying to draw before your mouse has said “click” (or if not, be happy for having one addiction less). One of the most successful therapy forms offered by DA are contests challenging the members to draw anything on everything: so far, the doodlers and their pens have attacked balloons as well as napkins. Who knows what’s next, so here are the last words of warning: never leave your belongings unattended – a doodler might creatively abuse them.